Published July 15, 2016 By Guest This post may contain affiliate links. Regardless, I only recommend sites I've researched and/or used and trust. How would you like to network with your peers, drive traffic to your site, AND have fun all at the same time? Well, you can accomplish that and more with Facebook groups! I learned about Facebook groups about a year ago. There are groups for just about anything, personal or business related: Shopify tips/tricks, blogging engagement, Amazon affiliates, surveys, favorite recipes, local garage sales, etc. I love that I get to engage with fellow business owners. You get the opportunity to learn so much! Since being a regular, active member of Facebook groups, I have seen tremendous traffic growth on my blog, Drink Coffee & Prosper. I also learned about the latest news coming to Pinterest, Instagram algorithm updates, the latest giveaways happening, and more. Sharing other members’ posts: This allows you to be ACTIVE and activity is usually rewarded by social networks with more shares of you own content. You get your posts/social networks shared: You get your info shared with a larger audience which means more exposure. I’ve also joined giveaways, learned about the latest in social media world, read inspiring stories, learned many tips and tricks about all sorts of things, and more! You will LOVE this roundup of Facebook groups I put together. Pinning Ain’t Easy is a blogger engagement group for Pinterest. Once you join, enjoy participating in daily engagement threads that will boost your Pinterest engagement. Pin other group members’ pins and get your pins shared on Pinterest in return. It’s a great way to increase your Pinterest following and get your pins seen by a larger audience. You can request to join here. For bloggers, social media influencers, and writers, this Facebook group is great for having your blog posts shared, Facebook posts liked, and get followed on many social networks like Instagram, Stumbleupon, and Twitter. There are different engagement threads daily, with average shares of around 20-25. This means you will have your post shared and gain an average of 20-25 followers with each thread that you participate in. Check out this group here. With over 2000 members, this is one of the larger groups on the list which is great for getting TONS of engagement, follows, and likes. I love how social and engaging this Facebook group is! There are daily engagement threads but there are also tons of posts from members sharing knowledge, asking questions, sharing giveaways and more. Their mission statement is pretty catchy: a place for bloggers and biz owners who want to build pro brands online to get smart, sleaze-free support + advice while forming sincere friendships. I really love that! Join this group here. Instabosses was one of the very first groups I joined. They are great if you are looking to boost your Instagram following and engagement. If you are looking for a loop giveaway to join, this is the group for you! The group admin is very active and offers coaching and courses too! Join here. THE place for bloggers! With nearly 15,000 members, you will find lots of great information in this group on a daily basis. A great group for blogger connection, social sharing, collaboration and more. I love that they share a guest post doc resource for those looking to guest post. Check out more information about Blogging Boost here. This group is all about blogger education. You will find great tips and tricks here often. The group is super newbie-friendly and you’ll feel comfortable enough to ask your burning questions to this group of 11,000 members. Highly recommended. This Facebook group is for bloggers and businesses. A social, friendly bunch where you will be able to enjoy engagement threads, shares on the newest social media info, and collaboration opportunities to work with other members. Check out the September Issue here. Ladyboss Lifestyle is all about networking and I love their group description: your safe place, your haven, networking event and digital par-tay. A really cool group and you’ll learn a lot. Join this group here. BEPG stands for Blog Engagement and Promotion group. One of my favorite groups for collaborations. You’ll find daily posts about collaboration opportunities so if you are a brand looking for a blogger or a blogger looking for a fellow blogger, this is the group for you. Instaloops1 is one of my favorite groups to find loop giveaways. It’s nothing but giveaways! Giveaways are great for increasing engagement, which is getting more likes and comments on your posts, as well as increasing your followers. Join this group here. A group that encourages collaboration and connection among business owners and bloggers. I love the inspirational stories that are shared regularly. Daily posts from the admin and group members. This group will be one of your favorites. Join here. That concludes the roundup! 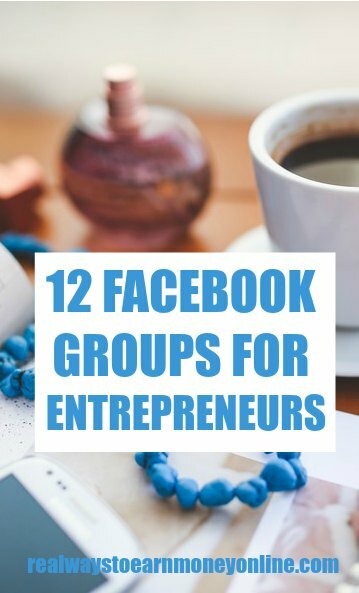 These 12 Facebook groups are really great resources to collaborate, grow your social networks, make friends, network and more! Don’t stop at 12. There are TONS of groups on Facebook that you can join to help you with social media, collaboration, growing sales, marketing, and so much more. Jenn Leach is the owner and contributor for Drink Coffee & Prosper. She enjoys writing about work from home life, starting a business, flipping websites, social media, and more. She shares her successes and failures in hopes of helping other bloggers and writers achieve success. Scoop the latest copy of her ebook here!